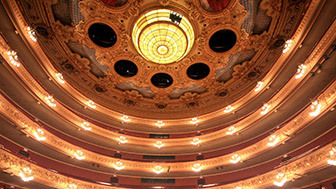 The Barceloneta has traditionally been the city's fishing neighbourhood. It was built from scratch in 1753 next to the port and outside the then walled city, and welcomed a large number of citizens soon after. The marine activity of the neighbourhood saw the emergence of a market specialising in fish and shellfish, which initially consisted of outdoor stalls until the construction of a Modernist building during the later part of the 19th century. The building, designed by Antoni Rovira i Trias, was a comprehensive and functional space and it replaced the traditional open-air stalls. This building remained in use for a number of decades, becoming one of the neighbourhood’s vital organs, until the start of the 21st century when it became clear that it would need to be refurbished. The architect Josep Mine, a friend of the late Enric Miralles, was entrusted with the refurbishment of the market. He respected the original wrought-iron structure and the brick walls but he also installed lifts, air conditioning, sewerage, new lighting, underground floors and photovoltaic solar panels, making the market the first in Barcelona to use solar energy. There are also two restaurants and an upper level that is used for functions related to the world of food and gastronomy. The market is also actively committed to sustainability, as evidenced by the plan for waste separation and recycling that it has championed, and for which it received an award from the Generalitat (regional government) of Catalonia. 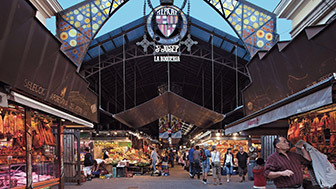 The Boqueria is a essential part of Barcelona that has become famous throughout the world. 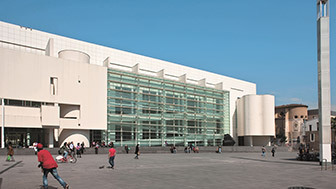 MACBA opened as a space for light, art and culture in the heart of the Raval.